Geek 101: What Is Jailbreaking? Have you ever looked at someone's iPhone home screen, and noticed that it has five icons in the dock? Or maybe you've seen a classic console emulator running on an iPad? Don't go looking for these apps on the App Store--these features and more are only possible with a hack called jailbreaking. So how does jailbreaking work, and what does it actually do to your coveted iDevice? Can you jailbreak on other platforms or hardware besides Apple's? What are the risks involved, and is it even legal? Read on as we try to answer all of your jailbreaking questions. And if we don't, feel free to ask more questions the comments! Here to help out is none other than notorious iOS hacker Jay Freeman (aka saurik), technology consultant and creator of the alternative App Store, Cydia. Jailbreaking: The process of bypassing restrictions on iPhones and iPads to install other apps and tweaks not approved by Apple. Rooting: A process similar to jailbreaking for hacking Android devices, game consoles, and so on. "Rooting" and "jailbreaking" are often used interchangeably. Root: The "superuser" on various operating systems such as Android, iOS, and Mac OS X. When you gain "root" access via jailbreaking or rooting, you can access and modify every file on your gadget. Cydia: A popular "unofficial" app store for jailbroken iOS devices. CyanogenMod: A custom version of Android available for rooted Android phones and tablets. Many smartphone, tablet, and game console makers include a layer of Digital Rights Management (DRM) software on their products. This DRM exists either to limit the software you can run on it, or is there for security reasons. Jailbreaking is the process of hacking these devices to bypass DRM restrictions, allowing you to run "unauthorized" software and to make other tweaks to your operating system. More technically, jailbreaking can be thought of as the process of installing "a modified set of kernel patches (the kernel being the supervisor of the operating system) that allow you to run unsigned code," as saurik explains. It also gives you root-level access, which is otherwise unavailable. The term "root" comes from UNIX, where it is the superuser account that has unrestricted rights and permissions to all files. This provides you with added flexibility, but it also has some inherent dangers (more on that later). You can alter or install anything onto your phone or tablet such as UI hacks (like the 5-icon dock) or unofficial apps (like classic console emulators) that would not otherwise be accepted into the App Store. Saurik's alternative app store, called Cydia, is arguably the definitive repository of such apps or tweaks. Cydia is so ubiquitous in iOS jailbreaking circles that most jailbreak tools install it automatically. iPhone hackers first coined the term "jailbreaking" in reference to breaking the iPhone out of Apple’s iTunes “jail.” The term has since been (somewhat erroneously) used in a more general sense to refer to similar hacks made to other platforms like Android, where it's also known as “rooting”. In any case, the basic concept is the same, regardless of what you call it. For better or for worse, iOS is a closed environment: Apps need to adhere to Apple's stringent guidelines to make it onto the App Store. To a certain extent, this restriction exists for your own protection and to maintain the overall quality of apps. There are some apps, however, that don't make the cut but arguably ought to--the WikiLeaks app for iOS comes to mind. "When you go to the App Store and install an app, you click [the icon], it opens, you do stuff with it, you hit the home button to close it, it goes away," saurik says. "An app is a self-controlled universe hidden behind a single icon." 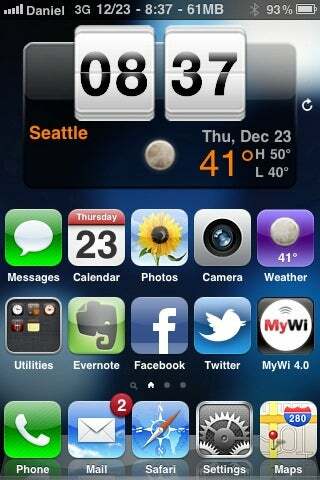 Anything outside this simple design--like saurik's UI theming mod called Winterboard, or any other alterations to built-in apps--is strictly forbidden. To Apple, an app is like a sandbox. Your app can only play within the sandbox, but if you want to roam outside of it, jailbreaking is your only option. Jailbreaking has some inherent risks. Root access is necessary for modding, but it can also open the floodgates for malicious attacks. Although there haven't been many documented cases of this, one hacker did create a harmless Rick-roll worm known as iKee to emphasize the vulnerability of jailbroken devices that haven't been properly secured by users. Additionally, because jailbreak apps don't have to adhere to Apple's guidelines, some users complain about general instability, increased data usage, or decreased battery life. At this point, some users argue the value in jailbreaking has diminished as iOS matures and incorporates features that were once only available to modders, such as multitasking, home screen backgrounds, and improved notifications. One might argue, however, that without jailbreaking, Apple may not have adopted some of these features in the first place. In the ongoing cat-and-mouse game between Apple and iOS hackers, some might say that Apple has been gaining the upper–hand as jailbreak tools have begun to slow in release. New jailbreak methods used to be released within days of an iOS version release (if not before), but as Apple vigilantly seals security holes with every new firmware and hardware update, hackers may be struggling more to keep up. For example, a jailbreak for the iPhone 4S and iPad 2 only recently came out--months after Apple released them. Still, when it comes to hackers, if there's a will, there's almost certainly a way. Absinthe A5 lets you jailbreak the iPhone 4S and iPad 2. Generally, jailbreaking tools come in the form of OS X or Windows desktop applications. Currently, the only tool to jailbreak the A5 processor-based iPhone 4S and iPad 2 with iOS 5.0.1 is called Absinthe. Other tools, such as PwnageTool and redsn0w, are only able to jailbreak older devices running iOS 5.0.1. The renowned iPhone Dev-Teamreleased the very first jailbreak tool, and the group is still central to the iOS hacker community; its blog is a good place to go to see what's new in jailbreaking tools. It depends a little bit on who you ask, but as far as the US government is concerned, it is legal to jailbreak your smartphone. In 2010, the Digital Millennium Copyright Act (DMCA) recognized the arguments of the Electronic Frontier Foundation (EFF, the international non-profit digital rights advocacy organization) to add phone jailbreaking to a list of exemptions to anti-circumvention provisions. This DMCA exemption is up for review again this year, and the EFF and other groups like the Software Freedom Law Center hope to get the exemption expanded to cover hacking other personal computing devices--like tablets and game consoles--as well. Imagine buying a car with the hood welding shut so you can't modify it. Some say that's just not right. Some folks, particularly hackers and modders, insist that jailbreaking is a right and do it as something of a statement. They'll often compare it it souping up a car: Imagine buying a car with the hood welding shut so you can't modify it. Some say that's just not right. Mike Keller is GeekTech's resident iOS developer nerd. Jay Freeman (saurik) is a technology consultant and the iOS hacker responsible for the alternative app store, Cydia. Log on next week for an in-depth conversation with saurik about the past, present, and future of Cydia.